If you look around in the cloud file hosting and synchronization, you will notice that things are heating up with new contenders like Cubby or Google Drive joining the market, and existing services like SkyDrive or Dropbox adding new features. Services share features, like a synchronization software that users can run on their computer systems to sync their files with the cloud, or Gigabytes of free storage that users get when they sign up. But services differ a lot beyond this point. This includes compatibility with operating systems and mobile devices, as well as functionality of those clients and web services.This includes the free amount of storage that users get when they sign up, upgrade costs or features that the clients and web services offer to their users. Most cloud hosting and synchronization services use a root folder on the system that is automatically synchronized with the cloud. Some, like Cubby, offer more flexibility in this regard, as they allow users to pick any folder on the system for syncing with the cloud, or direct synchronization with another computer or device. Windows users who'd like to improve the accessibility of those folders on their system can assign drive letters to folders to do just that. This basically maps the root folder of the file hosting service with a drive letter on the system, which reduces the file path and makes the files more accessible as a result. One of the most comfortable options to map folders to drive letters is a program like Visual Subst (see our previous Visual Subst review here). While you can use the subst command for that as well, you'd have to run the command every time you'd want the folder to become available as a drive letter. You could write your own batch file for that and run it automatically on system startup, or use Visual Subst which provides you with that option and an easier to use graphical user interface. You see an interface that looks similar to the one below. All you need to do now is to select a drive letter from the pulldown menu in the lower half of the screen, and click on the folder icon above the close button to select a local folder that you want to map to it. A click on the plus icon adds the selection to the program window, listing the virtual drive letter and the selected folder that is mapped to it. Open Windows Explorer to test the new setup right away. If you have made an error, delete the mapping again and start anew until you get it right. You can map multiple folders to drive letters, which can be useful if you are using more than one synchronization service, or want specific folders accessible as separate drive letters. 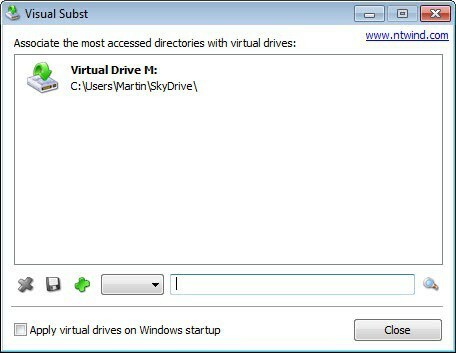 Check the apply virtual drives on Windows startup option if you want to make the option permanent. Ahhh . . . got it–thank you! Why not just add the SkyDrive folder location to your favourites in windows explorer? For me installing the software added SkyDrive to my favourites anyway. Find the Sky Drive folder in windows explorer left pane and click on it so the files are visible in the right hand pane. Right click on the SkyDrive parent folder in the left hand pane and select add to favourites. No need to map drives at all with this method. It may be easier to access the files on SkyDrive if they are mapped to a drive letter, especially if you are working on the command line. Any idea how to get the Drive mapped to a network location? i.e. get the Skydrive to place its files it \\server\output\location?